Pandora WUX is a Pandora FMS internal component, which allows users to automate web browser interaction. 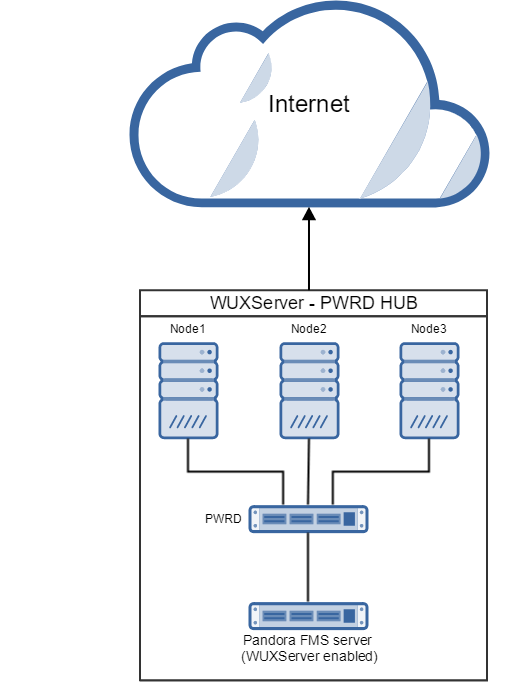 In order to work, WUXServer must be connected to a Pandora Web Robot Daemon (PWRD) server. PWRD is a service that executes step by step pre-recorded actions by the user in a web portal. To achieve this, PWRD uses Selenium web automation technology. It is therefore imperative that the user shows Pandora WUXServer the actions that must be performed to navigate through the web portal. With this data, Pandora WUXServer will generate a report with the results of the performances, time spent, and screenshots with the possible errors found. Pandora WUXServer is able to split the browsing sessions into phases, which simplifies the view and helps us to debug possible bottlenecks. Pandora Web Robot Daemon is a service, which provides tools to automate web browser sessions, using a file containing a list of necessary actions in order to navigate the user's web portal. Firefox 46 Binary for Windows. Pre-built profile to perform web browser sessions. Server for session automation (Selenium server). In order for PWRD to be able to launch Firefox on our Linux server, it will be necessary to install xorg-x11-server-Xvfb and gtk2 to be able to virtualize graphical environments. Then, proceed to install PWRD daemon, which can be found in the folder /usr/share/pandora_server/util/pwrd/ when installing the Enterprise server. Once installed, we must start it. Standalone: This is the standard mode; it will launch a single PWRD instance, each will be assigned to a Pandora FMS server. HUB: Concentrator mode. In this mode, PWRD service will not evaluate browser sessions directly; instead, "nodes" will have to be registered to execute tasks. This is the cluster mode from the PWRD service. Each HUB will be assigned to a Pandora FMS server. 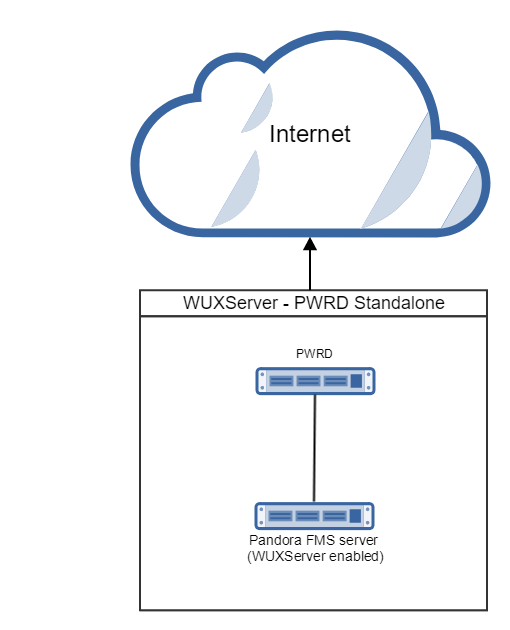 PWRD in standalone mode, will start the daemon and will prepare it to execute the actions indicated by the user through WUXServer. Concentrator mode or HUB will start the daemon as a load balancer. In this working mode, the system will balance the load between all nodes registered in the system, assigning the execution of the navigation sessions, depending on their workload. TCP/4444 connectivity from the computer that hosts the node to the computer that hosts the HUB. In this work mode, the service will process all queued requests from the hub (HUB), returning the results of the executions to it. It will be the HUB who will speak exclusively with the WUXServer, being transparent to the one who is executing the actions of the user. 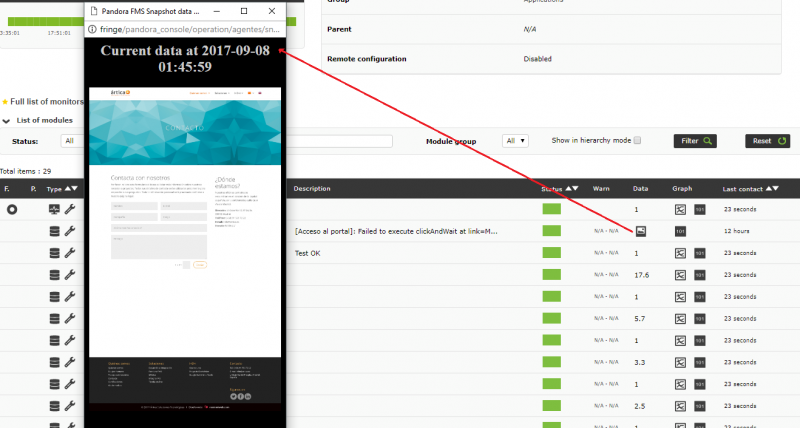 Regardless of the chosen mode, once started, we can start assigning executions of our browsing sessions, adding the configuration parameters of WUXServer to the configuration file of our Pandora server. Steps to prepare a working environment for Pandora WUX on Windows. Nota: We strongly recommend Linux to host the PWRD service. Install Java 1.8 on the machine. Install Firefox 47.0.1 (download from https://ftp.mozilla.org/pub/firefox/releases/47.0.1/). To do this we have available the "PWR recorder" utility in the module library. From this moment we will be able to browse the website that we want to monitor and the different actions of each step that we advance will appear in the recorder. After verifying the validity of the sequence of navigation, save it (File -> Save Test Case).This will be the file that we will load when creating a new web analysis module in our Pandora console. 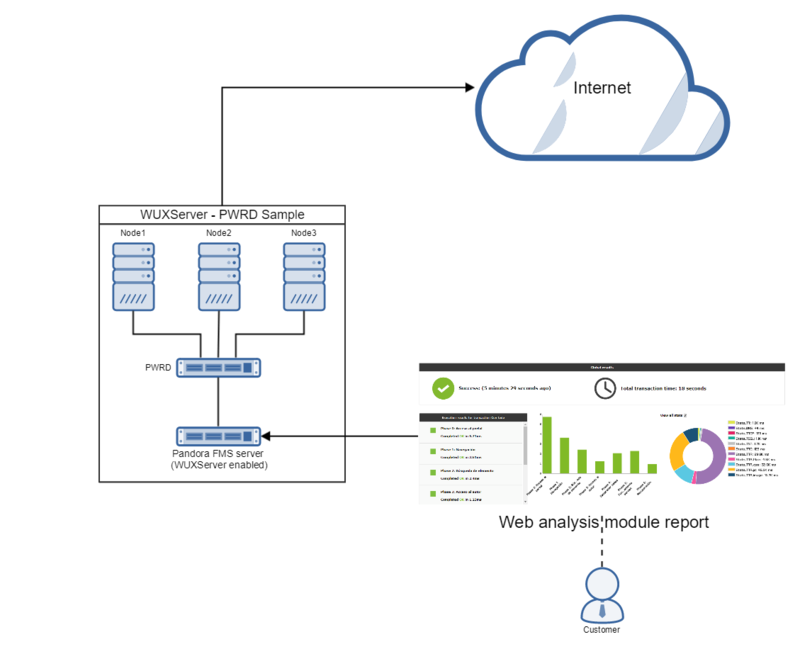 Pandora WUX allows you to split browsing monitoring of a website into multiple modules, representing each of the steps performed. To insert a new control point and generate the phase modules (up until that point) right-click on the point where you want to identify the start phase. All commands that are run between a phase_start y phase_end label will be covered in this phase. Once we have our browsing session recorded, it's time to deploy it as a module in Pandora FMS console. Module Name: Module WUX (Father), all sub-modules with monitoring results will be dependent on this new module. Target Web site: For monitoring performance statistics of website. Run performance test: Indicates that we want to monitor not only the browsing experience, but also the performance statistics of access to the target web site. Historical data: Saving or not saving the historical data modules that monitor that user experience. textarea section: in this text box we must copy (or upload) content files of the browsing session we have previously recorded. The operation of custom macros involves the substitution of certain text strings that are present in our file of browsing session with certain customizable values. In the case of web analytics modules, this feature has been improved, allowing dynamic macros which allow these values to be translated into dates and times variables. Let’s suppose that we need to monitor, through a browsing session, the proper functioning of a web application that focus on booking meeting rooms. If we establish a date and time fixed, the system would probably cancel the reservation because at some point it might stay in the past , for example could be trying to book a room for last week. We may also find a maximum of time to carry out that reservation, and that the system requires us to book the room within a certain period of time, for example, not exceeding the current month. To avoid editing the macro every few days, and worrying about the configuration section, you can use the dynamic macros, telling the system to always book the room for the next day when doing the test. "n" may be an unsigned number (positive) or negative. module_Global_Status: Indicates the global state of complete browsing. module_Global_Time: Indicates the global time lapsed of complete browsing. Attention: If you upgraded from versions prior to Pandora FMS 7.0NG 712 you must make a small change. In the screenshot above you can see the difference in time of the two phases that our record is divided into as well as access statistics to the front portal. Stats_TT: Total time to obtain the website. Stats_TDNS: Total time to resolve the IP address of the target. Stats_TTCP: Time spent on connecting via TCP..
Stats_TSSL: Time spent on establishing SSL communication. Stats_TST : Time lapsed until data transfer started. Stats_TTC : Time spent transferring data, It will gather all the transfer time of the resources. Stats_TTR : Time used to transfer the content of the page. Stats_TTR_main: Time lapsed to transfer the HTML code. Stats_TTR_image: Time used to transfer resources of type of image (png|jpg|jpeg|bmp|tiff|gif|webp|svg). Stats_TTR_css: Time spent on transferring style sheets. Alerts associated with Web analysis modules follow the same dynamics of operating as the entire system of alerts in Pandora FMS.